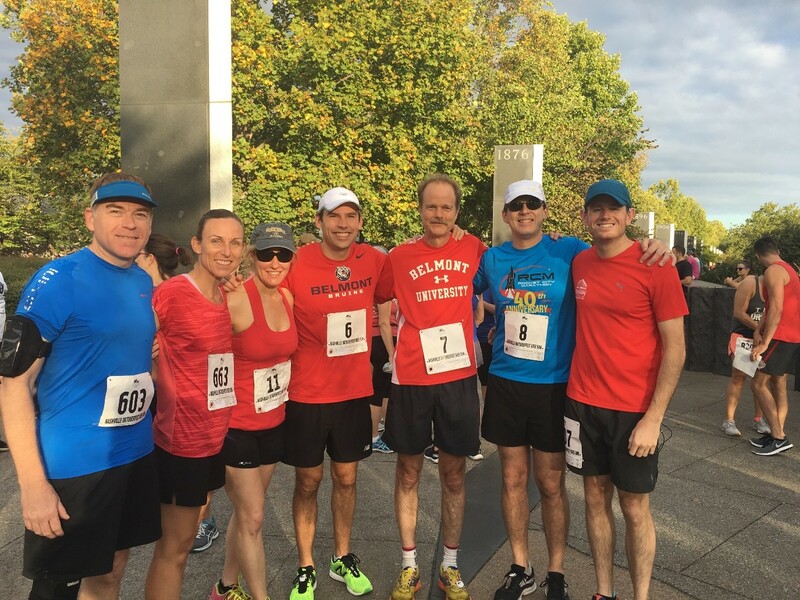 Belmont University’s 5K Team, organized and coached by Associate Professor of Business Law Haskell Murray, placed first in the B Division at the Nashville Octoberfest 5K on Saturday, October 7. Belmont’s team earned the B Division designation based on the size of its team, but when comparing race finishing times, Belmont’s team would have placed first in any division. Participants included (from left to right in the photo above) Director of the Center for International Business Jeff Overby, Assistant Professor of Law Deborah Farringer, Assistant Professor of Nursing Tracy Johnson, Murray, Director of the Honors Program Jonathan Thorndike, Chair and Professor of Mathematics Andy Miller and Assistant Professor of Psychology Timothy Schoenfeld. A Tennessee tradition since 1980, the Oktoberfest is Nashville’s oldest festival and the largest fall festival in the south. Nashville’s Oktoberfest returned to historic Germantown for the 38th year, where festival goers celebrated their German heritage. “In anticipation of over 300,000 visitors to our festival, we expanded the Oktoberfest to 4 days, Thursday to Sunday. By moving the location a few blocks to Jefferson Street and adding this extra day, we had more space for festival guests – and room for some exciting new areas. This year we featured Germantown’s first Ferris Wheel, which soared 65 feet over downtown…plus more than 40 restaurant and food vendors and approximately 150 merchants and vendors,” stated Michael King, event producer and owner of Monell’s Restaurants in Nashville.